Whether you are going for a day trip and some short strolls with toddlers or planning on racking up some mileage in the backcountry, this national park should be on your list of places to visit. Besides all the abundant natural splendor, the other thing I loved about the North Cascades was its distinct lack of people. Just under a million people visited this park complex in 2017, a number the Great Smoky Mountain National Park surpasses every month. The North Cascades National Park Complex includes the north and south units of North Cascades National Park as well as Ross Lake National Recreation Area and Lake Chelan National Recreation Area. Most of these million visitors head to the Ross Lake National Recreation Area which encompasses not only the eponymous lake but also Highway 20, the main road through the park. There are some awesome easy trails just off Highway 20, nice when you have smaller children with you and you are visiting in mid- June when many of the more difficult to access trails are still snow- covered. It takes about an hour to drive from the North Cascades Visitor's Center in Newhalem to Washington Pass on the other side of the park. There are quite a few viewpoints and short trails along Highway 20 so I would plan on making a whole day of it, especially if you are going there and back as we did. Not a bad drive, right? If you want longer trails, you will find plenty of those off the highway but you will need to check on the weather and snow cover before setting off. Some of the trails we wanted to do were inaccessible due to snow in late June, including Rainy Lake and Cascade Pass. We decided to hike several short trails and drive through the entire park rather than taking one, day-long hike and only seeing part of the park. Your best bet is to stop first at the main Visitor Center in Newhalem (there are also Visitor Centers in the north section of the park and down by Lake Chelan) and talk to the rangers about weather conditions. Or you can check out the Wilderness Center in Marblemount for backcountry permits and trail conditions. The Visitor Center itself is also worth a tour. They have multiple, 5 minute long videos on a loop covering different topics about the park, from glaciers to climate change, that we all enjoyed watching. You can explore a large topographic map of the park and all of its glaciers as well. Several interpretive trails lead from the Visitor Center around the Newhalem area. See the NPS's helpful PDF for a list of the trails and their descriptions. The Visitor Center also has a small room exhibiting all the different habitats of the Cascades as you climb up and over the mountains. Don't miss my personal favorite, the ice worms of the harsh alpine environments- who knew there was such a thing? It also covers in detail the "rain shadow effect", explaining why the eastern side of the Cascades is basically a desert while the western side is a rainforest. 1. The Trail of The Cedars, Newhalem. Any of the trails around the Visitor Center and Newhalem are great but I particularly liked the Trail of the Cedars. The interpretive signs were interesting and the kids actually read most of them. The trees are impressively tall and the trail ends at a small powerhouse on a creek. It is a short loop (0.3 miles) but you can connect to almost all the other trails in Newhalem at the powerhouse at the end. The NPS has a helpful PDF showing them all. ***The Skagit General Store is steps away from the trailhead and has sandwiches, fudge, and coffee. Seattle City Light has a visitor center across the street (Newhalem is a company town, built to house the power company's workers), and you can inquire about daily tours of Diablo Lake or the Gorge Powerhouse in the summer. This is a 0.5 mile trail that is partially paved and has a fantastic view down to the Gorge Lake Dam and a beautiful waterfall. The parking area is right off Highway 20. Walk the trail and then walk out on the nearby bridge for some great photography spots. Gorge Lake is closest to Newhalem of the 3 lakes in the park. This can be a long or short hike, depending on your mood. The Thunder Creek Trail goes 20 miles to Park Creek Pass but many hikers just go 2 miles upriver to the first bridge before turning around. It is a scenic and easy hike along Thunder Creek, with tall trees to admire and little elevation change for little guys to complain about. We brought lunch with us and used the backcountry campsite just across the bridge as a picnic spot. Colonial Creek Campground is a well-marked exit off Highway 20 and you will need to drive to the far end of the campground to get to the trailhead. Diablo Lake is between Gorge Lake and Ross Lake. There are lots of other day hikes in the park that we did not get to because of time constraints and snow cover but have plans to return to one day. I would particularly like to do a hike/ water taxi combo on Ross Lake. Ross Lake Resort will take you by boat to a number of trailheads around Ross Lake, from where you can hike back to your car. See their website for more information about stops and prices and the NPS map of Ross Lake for trailheads. A hike to Big Beaver or Hidden Hand and a watertaxi back seems like a great way to spend a day. Also on the list is Cascade Pass, one of the most popular trails in the park. The forestry road to the the trailhead was closed because of snow when we there in late June but I plan on returning one day in late July or August to hike this trail. It is a great hike for kids because although it is steep (1700 feet elevation gain), it is not long (3.7 miles) to a fabulous viewpoint. That's a manageable amount of Skittles to bring along as bribery. 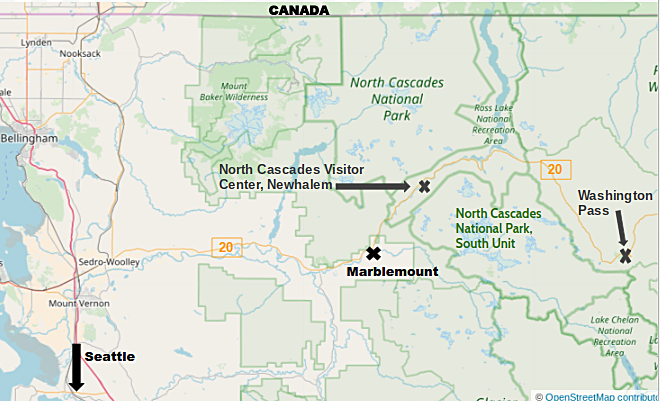 ***The trailhead for Cascade Pass is accessed from Cascade River Road which splits off from Highway 20 in Marblemount. Check in at the Wilderness Office there in Marblemount about road and trail conditions. Cascade Pass Trail can be seen in the bottom right-hand corner of the map. Map courtesy of the NPS. This viewpoint lets you walk out to an overlook of Gorge Lake as well as the bridge spanning the gorge which has a spectacular waterfall. Even if you don't do the short overlook trail, get out of the car for the bridge and waterfall. This overlook is on a prominence so you get a great, not quite 360 degree view of the lake below. There are also a few covered picnic tables that would make for a memorable snack break. I also liked the interpretive signs about the geology and glaciers you can see from the overlook. More of a pullout on the shoulder of Highway 20 than an actual stop, it still has a beautiful view over Ross Lake and one interpretive sign about how glaciers created the landscape below. Maybe the most skippable of the viewpoints if you are running short on time. This was my favorite viewpoint. The road up to the overlook was still closed for snow in late June when we were there so we (and several other people) parked on the side of Highway 20 and hiked up the closed road for a mile to the overlook. It was absolutely worth it. Hike the paved trail leading you on a short loop to gorgeous views of the Pass and the highway below. There are picnic tables and bathrooms at the parking area of the overlook. 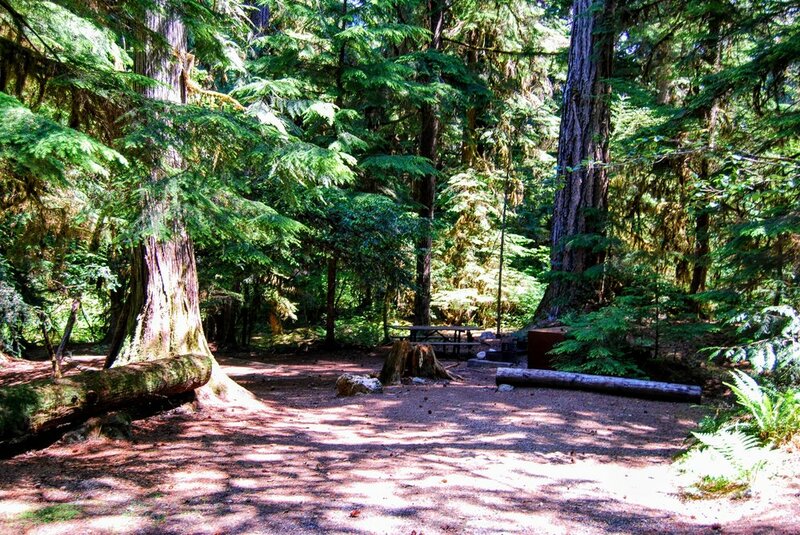 * The 5th campground in North Cascades, Hozomeen, you will need to go to Canada to drive to. The NPS has a good website describing all of them. I scouted Newhalem and Colonial Creek campgrounds for future visits and thought both were some of the nicer park service campgrounds I have seen. Campsites were large and the huge amount of tree cover meant you felt some separation from neighbouring sites. Campsite in Colonial Creek Campground. Colonial Creek campground is on Diablo Lake and many people brought SUP's or kayaks with them to spend their days in ways I was very jealous of. Newhalem and Goodell Creek campgrounds are closest to supplies in Marblemount and are along the Skagit River for fishing and kayaking activities. Colonial Creek and Newhalem have reservable sites (see www.recreation.gov) while the rest are first come- first served. Campsites cost $16 a night (except for Hozomeen and Gorge Lake which are free). Canoeing and paddleboarding on Diablo Lake near Colonial Creek campsite. We stayed in this cute and cosy 3 bedroom cottage with our group of 6 (2 adults and 4 kids ages 13-9). We would absolutely stay again. The River House was roomy, comfortable, and had one of the best stocked kitchens I have seen in a rental. The owner Mary was quick to respond to email questions and clearly loves the area. The best part is the beautiful riverfront though and the outside fire pit. ***If you have a really large group, Mary also rents out a large, new RV on the property separately. The house and the RV can't be seen from each other so there is plenty of privacy. There are lots of other vacation houses and cabins around Marblemount and nearby Mount Baker. Check VRBO and Airbnb for options. There aren’t, however, a lot of hotels in the immediate area so we didn’t find booking.com to be that helpful. If you are willing to stay out by interstate 5, you will have more luck. But pickings are still pretty slim. The nearest supplies to the west side of the park are 2 gas station/ minimarts in Marblemount. They are surprisingly well- stocked, including beer and wine, if not the cheapest. The nearest large grocery stores with better prices are in Sedro-Wooley and Burlington, about 45 min away from Marblemount. You do not need a pass for the North Cascades National Park but you will need a Northwest Forest Pass ($5/day or $30/ year) if you park at a trailhead in a national forest. You buy them at ranger stations or online. We needed the pass when we went to nearby Mount Baker National Recreation Area. You will also need it for parking at some of the popular trailheads just on the outside of the national park, such as Rainy Lake or Easy Pass. There are often self-pay kiosks for day passes at trailheads but not always. Highway 20 is not particularly curvy and we did not need anti-nausea medications despite having two kids who are prone to motion- sickness. Stopping frequently to get out at viewpoints helped as well. I look forward to my return trip to North Cascades National Park, probably later in the summer next time so I can do more serious hiking without worrying about bringing crampons. I loved everything about this park; its scenic beauty, its lack of crowds, and its lack of grizzlies. If you are planning a trip to North Cascades National Park, also look into the Boeing factory in nearby Everett, WA. It is a fantastic way to spend the day for everybody, not just the plane nuts in your family. Speaking as an only mildly interested plane person generally, the museum and tour were fascinating and well worth the price of admission.